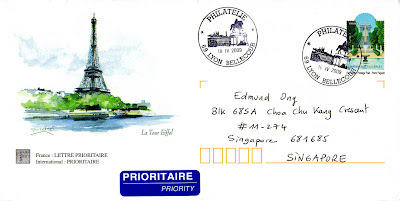 eD@HoMe: 2 lovely covers from the Turks and Caicos Islands, and France! 2 lovely covers from the Turks and Caicos Islands, and France! Today, I received my first cover from the Turks & Caicos Islands! It was sent by an eBayer for my purchases made on 26th March 2009. Firstly. let me give you some information about the islands. 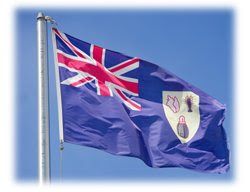 Home to roughly 30,000 residents, the Turks and Caicos Islands consist of 40 islands and cays, eight of which are inhabited. The islands are located 550 miles southeast of Miami, Florida, just below the Bahamas chain and just to the east of Cuba and the island of Hispaniola (Dominican Republic and Haiti.) 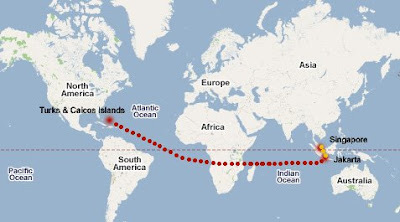 Technically, the Turks and Caicos are located in the Atlantic Ocean, not the Caribbean Sea. The stamp franked on the cover belongs to a set of 13 definitives stamps from the "Shells" series, issued in 2007. 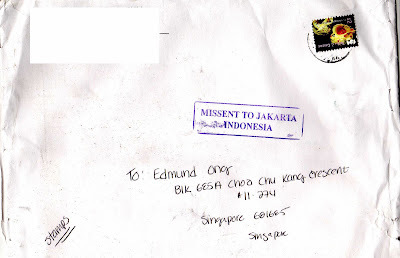 This cover was missent to Jakarta, Indonesia, from the Turks & Caicos Islands, and later resent rightfully from Jakarta to Singapore. All in all, it had traveled an estimated distance of 19,194kms!! The second cover for today is this beautiful prepaid French cover sent by Contesse Eric. Merci mille fois! Its shows the famous Eiffel Tower in Paris. This cover is valid for posting to anywhere in the world from France. Found this on YouTube. Hope you will love it too!